As the spring season finally arrives we’re also happy that the new month will also bring us another INTRODUCING show. The successful event series returns to Berlin on April 25 live on stage at The Reed, once again presented by NOTHING BUT HOPE AND PASSION. So, if you like to discover exciting new urban pop and alternative music as much as we do and just happen to be in the ciy, we would be thrilled if you come by. As always you don’t need to buy a ticket for this fancy event as this remains a free ‘guestlist-only’ affair. More info at the bottom of this page. Sorry, for shamefully using capital letters in the headline because usually Willem Ardui and jaywalker stylish their band as blackwave. And yes, that includes the dot! The two gentlemen from Antwerp distinguish themselves with a dash of oldschool hip hop, and produce their delicious 90s grooves with a big live band from the Conservatory of Antwerp. It’s really lovely to witness two Belgian lads dekuver such fine rap which proves that there are no border limitations anymore for the genre. This is going to be a pleasant opener for the night, so say the least. Now, this is a band that really breaks all boundaries in terms of sound and origins. Singer/songwriter Nora already grew up between Spain, Italy and Norway but after turning 18 she was invited to visit her biological father, an American/Guatemalan living in Los Angeles, which introduced her to an entirely new sort of music. In L.A Nora met Sju, a Slovakian London based hat maker and they started playing music together. Later, German keyboard player Jan joined the gang and Ora The Molecule was born. Their music is as versatile as their biographies, a colourful dream pop melange that combines the best from the past with a contemporary approach towards it. And they are a really enjoyable live band so don’t miss this one. The core and title-track of Connie Constance‘s debut album English Rose is a cover of the 1978 classic from The Jam and that itself is quite an interesting the fact as the music the young British artist produces couldn’t be further away from the sound of Paul Weller. But just like the legendary ‘modfather’ she’s trying to capture the society of her troubled home country forty years later. The England of 2019 looks way different and more diverse than back then but it’s also facing new troubles. 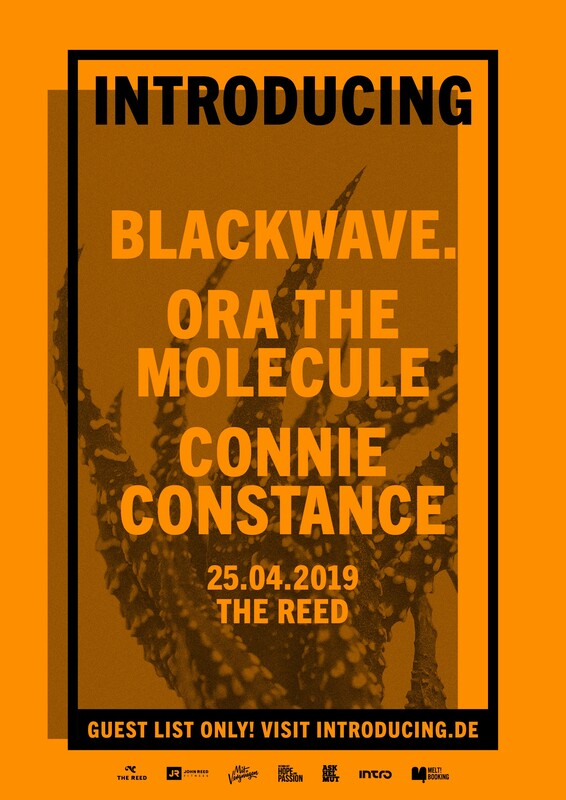 Nobody knows right now if the Brexit actually happened when Connie Constance performs in Berlin on April 25. Out of this uncertainty and chaos she creates haunting and beautiful soul pop with indie vibes and a tempting trip-hop notion that definitely makes us excited for more. The guestlist is open for a limited amount but in case it’s close don’t forget to check back at NBHAP and join the FB event in the meantime.